Testing Center? Streamline your facility - click here to see how! Teach for America saves "considerable man hours..."
Clients will love the convenience. So will you and your staff. Aloha Wellness has "eliminated missed or mixed-up appointments"
Greater flexibility and scalability mean you can start now and grow later. For Serenity Massage it´s "one of the best investments..."
It is easy to try before you buy. Take advantage of our unmatched pricing, built for your budget. Get the right information to the right person at the right time! Do you want to stay in touch with your clients? Want to set expectations and keep clients informed before an appointment? Would you like to follow up with a thank you or survey afterward? Or remind them to schedule their next appointment at the right time? Do you want to check in with clients who didn't show up? Yes? Then, our targeted email notifications are for you! You control the timing and content of the email. Yet the system sends them out automatically. Just create a template, optionally tied to specific service, timed to go out when it makes the most sense relative to the appointment. Dentists can automatically remind patients to schedule their next cleaning 5 months after the last cleaning. They can follow up with a patient who just had a root canal to ask how the patient is doing. Testing centers can inform students what to bring for each given test. Multiple location scheduling is a breeze... as always... like nobody else! No sneaky charges for high appointment scheduling volume or additional logins. Easy to Use. 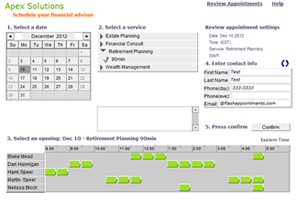 Our appointment scheduler is a rich internet application (RIA). Updates occur quickly on a single compact page making it easy for clients to shop for an ideal opening. That is important, especially when your appointment calendar is filling up and availability is limited.